I have been tossing around some ideas about the Lake of Fire (Rev 20) and thought I would now toss one of them to you. Many people, especially fire and brimstone preachers, have very firm views on what the LOF could be. But since the book of Revelation is so chock full of symbols, what the LOF stands for will always be open to conjecture, depending on your view of God. Those who view God as a vengeful judge see the LOF as a place of horrible torment in flames of fire for eternity. Properly translated, "for eternity" becomes "for the ages of the ages", but that doesn't alter the ugliness of this view very much. Those who view God with a bit more mercy than that see the LOF as a place where people are annihilated and removed from existence rather than tormented. Those of us who view God as a loving Father and the Saviour of the world see the LOF as the place where the rebellious are purified and made ready to move into eternity in fellowship with God. Using this last view, I am exploring some ideas on how the LOF might achieve this. Here is my latest. Firstly, I don't think the 'fire' part is a literal fire, but a symbol representing purification or cleansing or changing of form. Chemically, fire never destroys, it only changes the nature or form of things. Wood in a lounge fire is never destroyed but is changed or converted to other substances like smoke, char, ash, heat, light, etc. So fire in Rev 20 is a symbol for change or conversion of one form or nature into another. The 'lake' part indicates the size of the operation to me - not a small fireplace, or a forge or even a commercial furnace, but a huge expanse of conversion. The younger son had such a bad attitude to his father. He asked for his inheritance even before his father had died, he wasted it in a way that disrespected his father, he worked in places which disrespected his father's religion, etc., etc. Eventually he was in such a state of poverty, disgrace and torment that he came to his senses and decided to head home to his father. Due to his own rebellion, greed and foolishness, the place where he was, the nightmare he endured and the final effect that it had on him could easily be described as a life-changing LOF experience for him. Could each person create their own mini LOF out of which they come when it has done its work of conversion? And could all mini LOF's happening at the end of the ages collectively be the vast LOF of Rev 20 which brings everyone to bow the knee and be reconciled to God at the conclusion of the ages? PS The huge increase in church attendance that often occurs after disasters like cyclones, floods, droughts, terrorist attacks, etc. shows that earthly horrors have the potential to turn thoughts to prayer, repentance and to God looking for something better. Australia has superb surfing beaches. As well as the excitement of riding the white caps to shore there is also a dangerous undertow or rip lurking beneath them to avoid or overcome. Lifesavers patrol our beaches, mark the safest sections in which to swim and surf, and stand ready to save any who ignore the markings, become injured or fall victim to the outgoing undertow. The beach, its waves and undertow, the surfers and lifesavers form a neat picture of God's purpose to bring all of his creation to unity under the leadership of Jesus Christ. The water is littered with surfers on their boards, having left the shore some time earlier. Some are on the way in, some are sitting waiting for a good wave, some are just enjoying the view, some are paddling around, some are even heading out toward the open sea. But eventually, at the end of the day, all of them return to the beach. There are no options in the game plan. All go out to sea and all come back to shore. But what happens during a day's surfing? Some surfers immediately catch their wave and come straight to shore. Some choose to ride their wave more adventurously - changing direction, even going backwards at times, through the tube, up on the crest, lost in the foam, but eventually arriving "home". Others fall from their wave or miss it altogether and have to wait for another. Regardless of the variety of maneuvers or choices made by each surfer, the waves continue to travel towards the shore and all surfers will eventually arrive there too. The natural rhythm of the ocean, the unchanging laws of nature, guarantee that! So how does this picture demonstrate God's purpose in the world? The surf is the world. The beach is home, the final destination of every person in the world. The surfers are God's offspring, littered all over the world. Some catch waves that take them to Jesus in their lifetime, others take longer having missed waves or not been in the right place to even see one. The lifesaver on the beach is Jesus who is watching with great interest and compassion as his creation rides the waves and battles the rips of the world. God's unchanging purpose for all of his creation is to bring everyone home. We can't avoid it. It's the natural rhythm of the universe. Regardless of the choices we make, the number of waves we miss or ignore or fall from, eventually one of them will bring us to shore. All of us? What about the surfer who is injured, becomes exhausted, is totally captured by the rip and driven out beyond the breaking waves, or just never sees a wave? The lifesaver comes to the rescue. He brings to shore those who can't or won't get there themselves. That's what he's there for. He may even have to fight with them, overcome them, to bring them to the beach. Jesus once said he would even "drag" people home. Jesus is God's lifesaver. Jesus describes his role in the parables about the lost sheep and lost coin in Luke 15. A sheep and a coin that are lost with no hope of returning home under their own steam are rescued by their owners. No-one will drown while Jesus is on duty in the lifesaver's box! All of God's creation get home one way or the other. Translation of aionios or aionion. Roger, you might remember some months ago we discussed on Skype a range of suitable, literal alternatives for the translation of aionion. Some of these included age(s)-lasting, age(s)-during, pertaining to the age(s), belonging to the age(s), of the age(s), etc. Your suggestion was to use 'age-lasting' and I agreed to standardise on that. However I have had further thoughts on this and feel 'age-lasting' raises some unintended difficulties and can play into the hands of our 'everlasting' opponents, especially when translating passages like the final verses of Romans 16.
to God only wise be glory through Jesus Christ forever (into the aions). Amen. I won't dwell on the stupidity of the plural 'eternal times' in verse 25 or the incorrect 'forever' in verse 27, but concentrate on the 'everlasting God' in verse 26. Our opponents use this verse this way. Because the 'aionion God' is known to be everlasting or eternal, then the Greek word 'aionion' must really mean 'everlasting or eternal'. QED. It's a bit like saying ... because the 'red' house is known to have a tiled roof, then the word 'red' must really mean 'tiled'. If we decide to translate 'aionion' as age-lasting, our opponents then say that we are declaring God to be only lasting for the age or the ages, not everlasting or eternal, and so are in gross error in our translation. If we translate 'aionion' as 'of the age' or 'of the ages' we avoid this problem as God becomes the 'God of the ages', which is true, but does not limit Him to the ages, just as when He is correctly termed the 'God of Roger' does not prevent Him from being the 'God of Barry' as well. All this would be made easier if we translated 'aionion' as 'eonian', but although this is perhaps the most correct literal translation, it is probably too obscure for most ordinary people, and certainly the ones I hope will be reading the book. So I am now suggesting that 'aionion life' or 'aionion punishment' or 'aionion wheelbarrow' be translated 'life of the age(s)' or 'punishment of the age(s)' or 'wheelbarrow of the age(s)'. We humans have great difficulty understanding the Creator and His ways. I should know - I've spent decades of my life trying. One of the best ideas I have had in this pursuit is to think of the events of the world as a stage play in which the Author, God, has written the script and the Director, Jesus, has been given the authority and responsibility to ensure the script is faithfully performed on the stage. The stage play idea has some weaknesses if taken too far, as all illustrations and parables do, so I have only been using it tenuously and privately in my mind until this week, when I discovered other authors suggesting a similar idea. For example, C.S. Lewis in "Surprised by Joy" wrote that he thought God might project us in the same way a dramatist projects his characters, and Lewis could no more meet God than Hamlet could meet Shakespeare. In his journey towards awareness of a personal God, Lewis decided that if Hamlet and Shakespeare were to ever meet, it must be Shakespeare's doing, as Hamlet could initiate nothing. Interestingly, Lewis also conjectured that Shakespeare could make himself appear as 'Author' in the play and write some dialogue between Hamlet and himself. He then explained that the 'Shakespeare' in the play would be, at the same time, both himself and one of his characters, a bit like God and Jesus in the real world. William W Bentley, Jr. wrote a short essay called "The Simple Story of the Universe" which was presented as a play of 5 acts, with several scenes in each act. And Thomas Heywood, an English playwright of the 17th century, once said, "The world's a theatre, the earth a stage, which God and Nature do with actors fill." Amazingly all three of these writings came to my attention in the space of just one week, the week between Christmas and New Year, so I decided I should give my stage play idea more serious consideration than I had previously done and jot down my thoughts for you to consider. God wrote the script for a play through which His eternal purpose would be accomplished. He designed the stage and chose the role and character of each actor in the play. God produced a Son, called Jesus Christ, through whom the stage and the cast were created. Jesus was given the script and the authority and power to direct the play from beginning to end. During the course of the play Jesus donned an earth-suit and played the starring role. After the final scene of the final act, Jesus will present the whole cast to God when every actor will be warmly welcomed into God's eternal family. This way of looking things helps me in several ways. 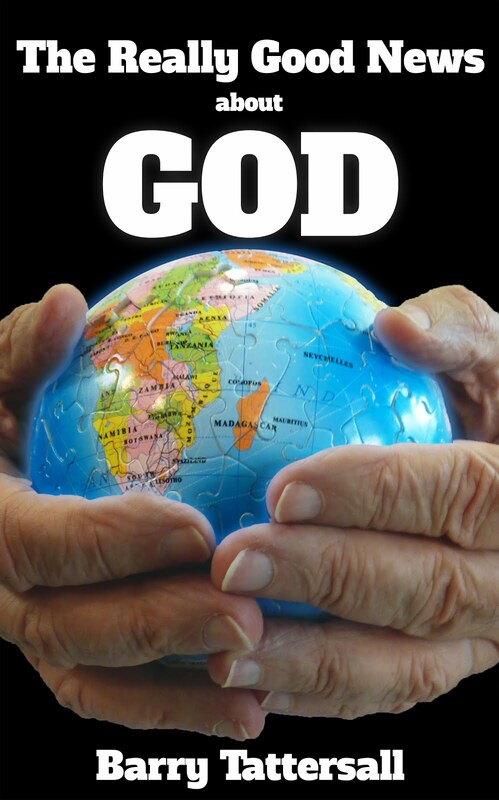 It reminds me that God is really in control of our world - everything is predestined. It reminds me to love even the villains in our lives, as their roles have been pre-determined by God (remember Judas?). It reminds me that God is love and fair, and that every actor will eventually be welcomed into God's eternal family, even if the villains have to be cleaned up a bit before they are presented to Him. It reminds me that God really is all in all. Well, that's the first time I can remember sharing this idea with anyone. Do you think it is worth fleshing out further, by revealing the script?